Standouts: Huge variety of trail conditions, Vernon Boardwalk Trail, “Stairway to Heaven”, amazing views including Pinwheel’s Vista. 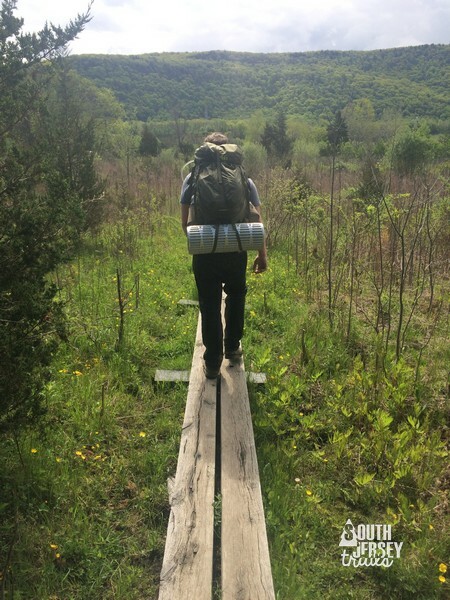 Description: It would be impossible for me to give enough of a detailed description of the trail, so for that make sure that you purchase a trail guide. What I can tell you is that this was an awesome trip with a wide variety of different trail experiences for such a short trip, and I loved every minute of it. This day was to be the gem of the hike, and it didn’t disappoint. We were up early, packed, and breakfasted. It was darn chilly, so I was happy to get moving. Unfortunately for us, the Pochuck Shelter is not at the top of the mountain. Yay for starting the day uphill! Over the next mile and a half, we climbed some sharp uphills, but none of them were very long in duration. 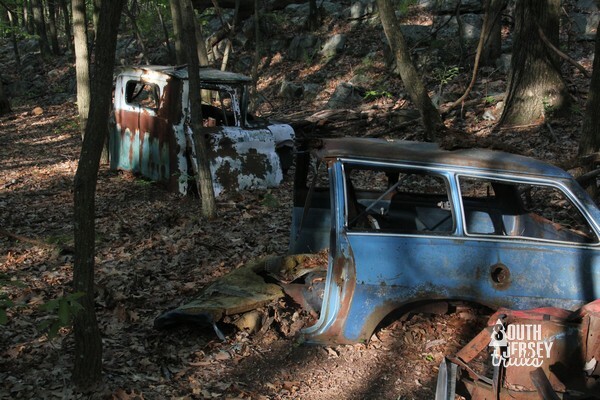 At the end of the first climb (only 0.2 miles), off to the right you’ll spot some old cars! We were pretty excited. On the next half mile, we climb some more, to the high point of the second climb. Somewhere up there was a pretty good view. Hey, we can see High Point from here. Under the shadow on the right side of the mountain ridge. The next 3/4 of a mile took us up some, over some wet bits, and up to the summit of the mountain. We made it! 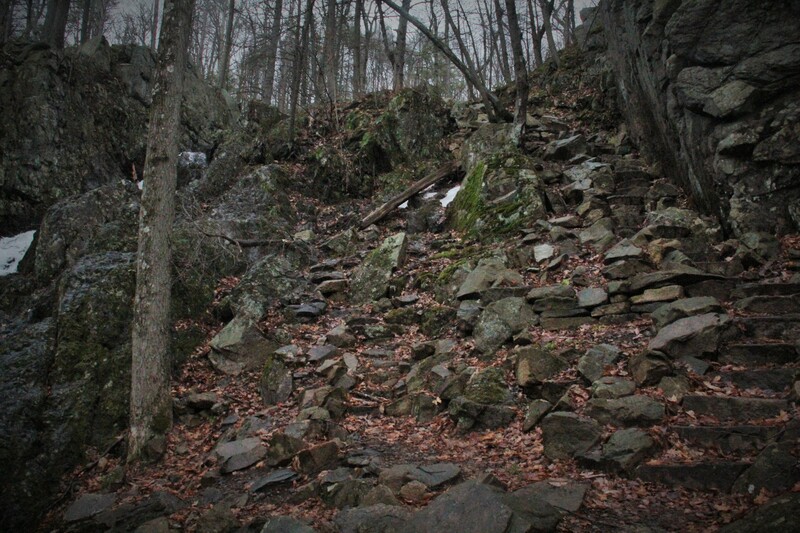 Once on top, it’s a fun little stroll through boulders and outcroppings. You have a few more wet areas, cross a dirt road near a summer camp (2.1 miles into the day! ), cross a stream (we stopped here for water, good flow! ), enter an awesome area of red cedars, cross a bridge, go a bit uphill, and end up at Route 565 (2.7 miles into our day). Across the bridge. Dan left us all in the dust this day. Crossing the road, we went another 1.5 miles, some up, but most of it down, until we hit Route 517, which is the bottom of Pochuck Mountain. If it seems like I rushed through that part, it’s because I did. Why? 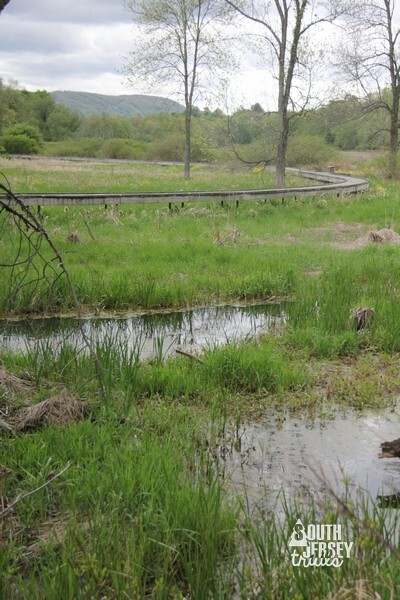 Because Route 517 marks the beginning of the whole reason we wanted to hike this section – the Pochuck Swamp Boardwalk. 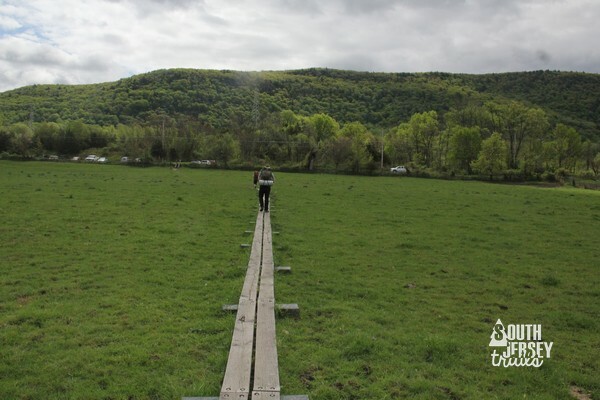 This series of three boardwalks and a bridge carries you just under a mile across a series of wide open swamps. The swamp is awesome, the views are amazing, and the boardwalk was a huge seven year construction project. 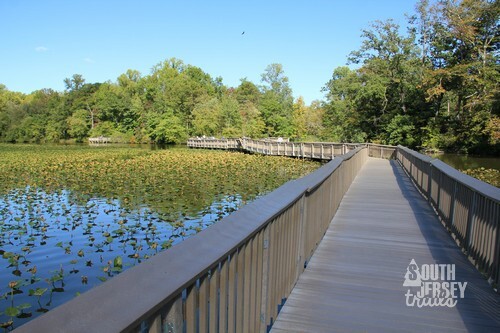 The first stretch of boardwalk is the longest at 2,000 feet! 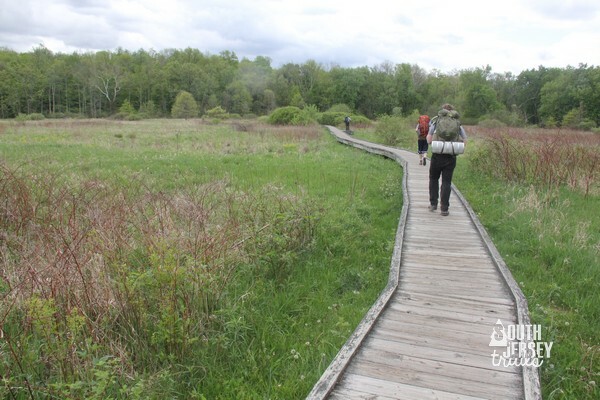 After a very short stretch of dirt trail, you’ll hit the second stretch of boardwalk which comes in at 1,200 feet. 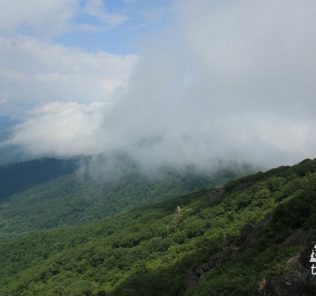 This one ends at the biggest suspension bridge on the AT, which crosses Pochuck Creek. 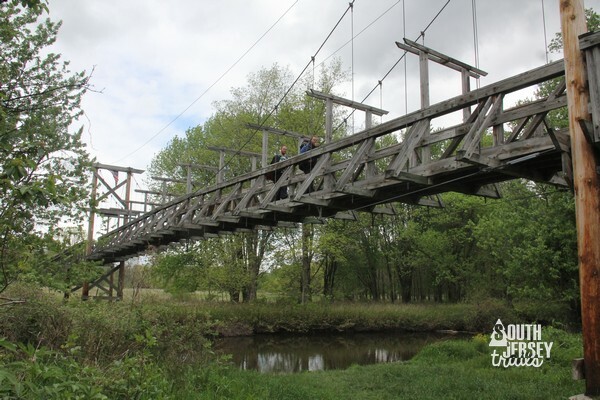 The bridge is also super impressive, another massive project on the Appalachian Trail. Hey! I’m in a picture! Coming down off the bridge, you still have an 800+ foot section of boardwalk to traverse. Then it’s a small area of non-boardwalk, across a bridge, and back into the woods. 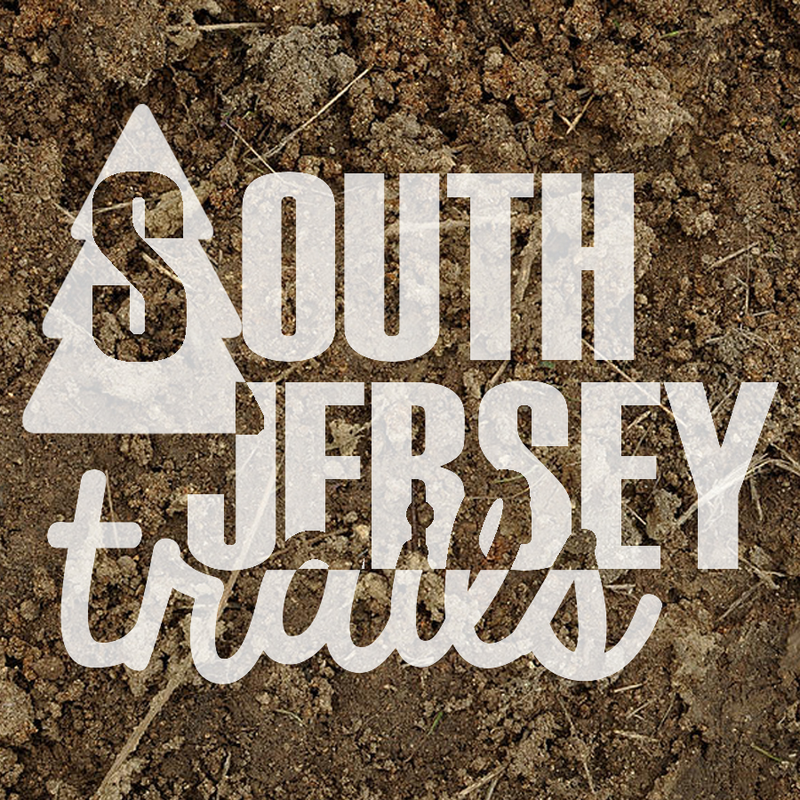 It is worth driving up to North Jersey just to hike this short stretch of trail. For serious. And I’ll be totally honest, I had gotten to this point of the hike plan and went OH GREAT WE CAN DO THE BOARDWALK and then walk another 6.6 miles to the car. That 6.6 miles turned out to be super-mega-awesome. 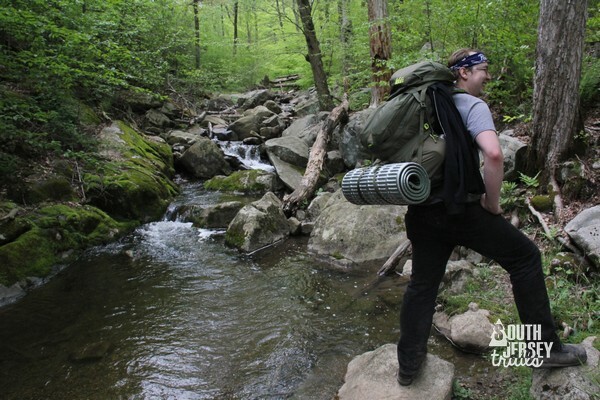 We started through the woods on some very well marked trails (and many well graveled), including crossing a few streams on bridges. We then went up over a wall and through a field, where we got our first glimpses of Wawayanda Mountain, which was to be our last big climb of the day (actually, our biggest climb of the trip). But for now, just a glimpse. Then it was across some railroad tracks (ACTIVE!!!!!!) and down into a field of cows. Well, sadly, it was just a field, the cows were penned up the next field over. But apparently the cows are sometimes in THIS field, right next to the trail. Then it was up and out of the field and onto NJ 94. This marked the end of Section 2 of the trail guide and, at 6.5 miles for the day (halfway!) the end of our morning. We’d been tipped off that a quarter of a mile to the left (if facing the road from the cow field) was a farmers market with ice cream, so away we went. There, we ran into one of our new friends that we’d made the night before. The store was welcoming to backpackers, so we set up shop at a picnic table and settled into a nice, long lunch. Skunk and I went with apple cider doughnuts, while the Js went with ice cream. By the end of lunch, we were bone cold. THIS WAS MAY!!!!! I had on all my layers, and was shivering uncontrollably. When that happens, there is only one option… time to hike. 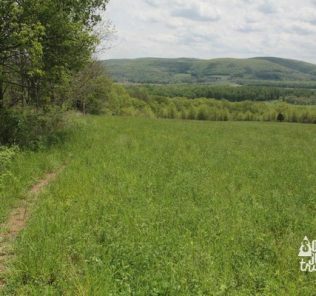 So we walked back down the road, turned left past the trail signs, and hiked the half mile to the base of Wawayanda Mountain. By the time we hit the mountain, we were warm again. Then again, once we started this 550 foot climb (in under a mile), we got way too warm real quick! 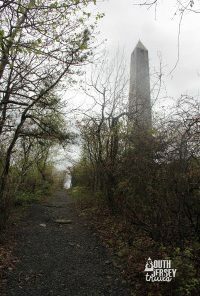 I hadn’t realized until the farm market that this next stretch was the “Stairway to Heaven” hike, one of those hikes I’ve seen listed all over North Jersey hiking sites, but never really knew where it was, because South Jersey. And that name was no lie. Straight up. Poor Skunk never knew what hit him. No description needed, other than up, up, up, up, and up. Little view part way up. 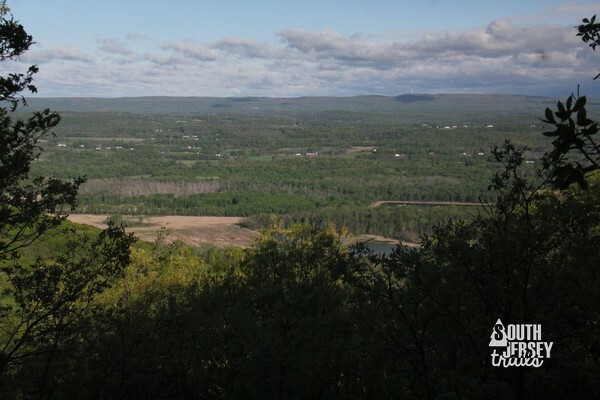 We found out really quickly why every hiking site in the state except ours covers this hike, it’s wildly popular. We saw more people climbing that hill than on the rest of our journey combined! And it wasn’t even nice weather! The vast majority were day hikers though, the only other backpackers we saw were a large crew of Mennonites. You might be tough, but are you Mennonites-backpacking-straight-up-a-mountain-in-collared-shirts-or-long-dresses-with-bonnets tough? Actually, we luckily didn’t know yet that the younger and in much better shape than us Mennonites were on our tail (we met them at the top of the mountain). Instead, Skunk and I (the slow pokes of the crew) were focused on beating one of the tiny, yippy dogs up the mountain instead. And we did! Barely! Thank goodness! 0.1 mile from the crest of the mountain, everyone stops climbing and heads sideways instead, down the flat side trail to Pinwheel’s Vista. And wow, what a vista. Sign and big ol’ pile of rocks at the side trail. Last view of High Point for the trip! You can see clear over Pochuck Mountain to the Kittatinny Ridge. It was freezing at the top (MAY! SERIOUSLY, MAY!!!! 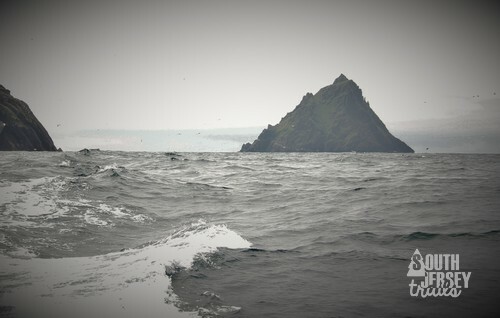 ), so we didn’t spend more than a minute or two enjoying the view before dropping back behind the rocks and out of the wind. 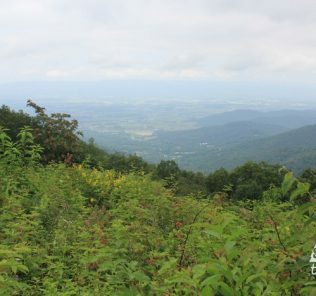 We then headed back to the AT, turned left, and a pretty easy 0.1 miles of uphill brought us to the mailbox at the summit (where we met Team Mennonite). After that climb, it was all cake. We cover the last 3.8 miles in under two hours. There were some climbs, but nothing resembling the Stairway to Heaven. Last view of the trip! Now, normally I’ve ridiculously wary of bears. 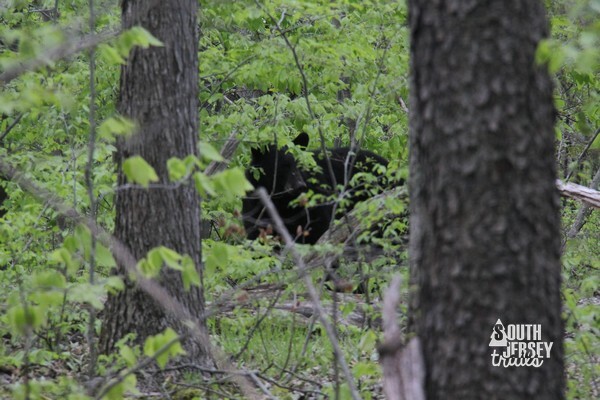 But with over a dozen hikers within shouting distance, I wasn’t too freaked out this time (unlike when I almost walked into one at Shenandoah… but that’s another story!). We all smiled and kept walking. We crossed the bridge, passed Team Mennonite one final time. 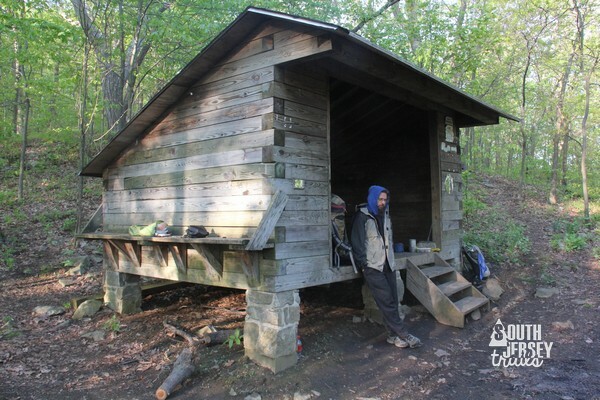 It was around a lake, up a hill, past the shelter, and then to an intersection with a woods road (0.2 past the shelter side trail). We turned right down that woods road, following the sign to the park office for Wawayanda. 0.2 of a mile brought us out into the open next to the maintenance lot (where they’d told us to park our car) and the entrance gate. We were done! Well, we loaded up, drove back to High Point to get the other cars, and then started our long, nonstop ride home to South Jersey. 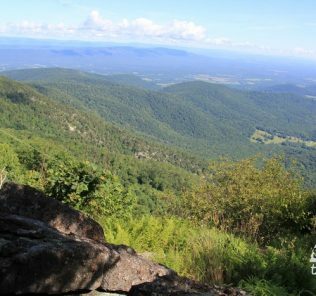 Overview: Hiking the AT is always a good idea, and this section is an even better idea than most. Great two and a bit day trip, not too terrible for beginners (Skunk survived! ), LOTS of highlights, water was good (but don’t even think about not filtering with all the farms around). Totally, totally great trip! Next section: From where we got off, it’s 1.7 miles of trail until you reach Longhouse Road. 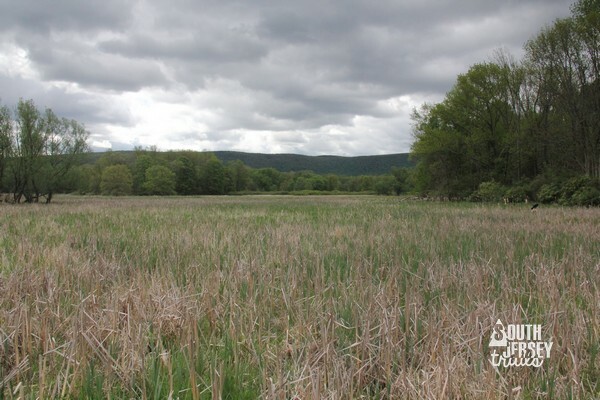 From there, we’ve got you covered for the next twenty miles of trail from Longhouse Road in NJ up to the Elk Pen Parking Area just past I-87 (New York Thruway) at the west side of Harriman State Park. 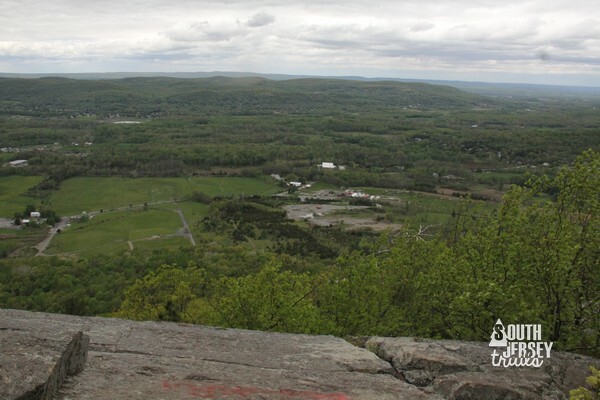 Longhouse Road, NJ to Elk Pen Parking Area, Harriman State Park, NY – 20 miles on the Appalachian Trail. Huge variety of trail conditions, Vernon Boardwalk Trail, “Stairway to Heaven”, amazing views including Pinwheel’s Vista. 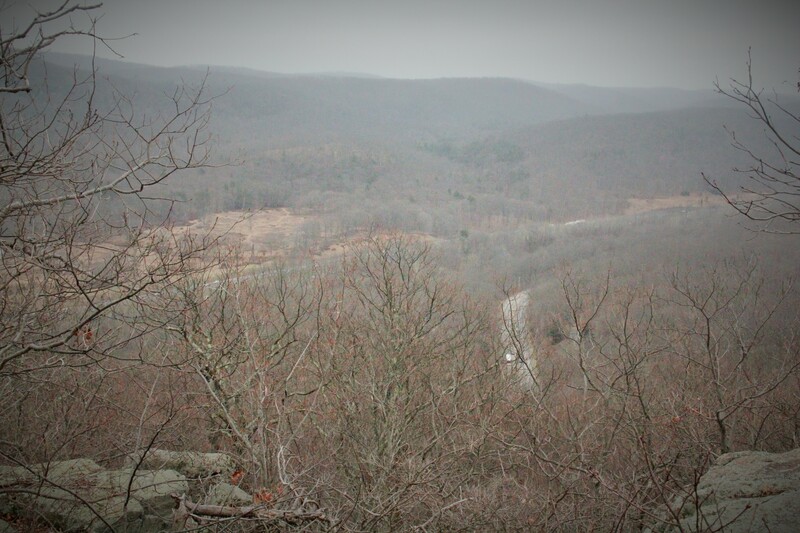 Oh, how I hate climbing when I leave South Jersey. 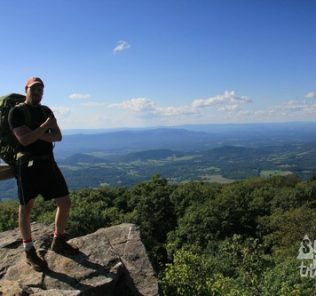 Hiking the AT is always a good idea, and this section is an even better idea than most. Great two and a bit day trip, not too terrible for beginners (Skunk survived! ), LOTS of highlights, water was good (but don’t even think about not filtering with all the farms around). Totally, totally great trip! 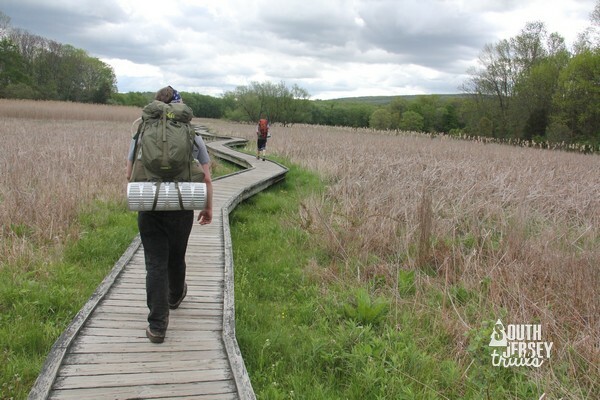 Appalachian Trail, Backpacking, Hiking, National Park, national parks, Outdoors., State Park, Wildlife. I thoroughly enjoyed reading this bit! I would LOVE to get here & do this hike! I don’t know about sleeping in the woods though. But I would love a day hike here. You made it sound WONDERFUL! And it was funny! I love funny! Thanks for the enjoyable read! I hope to make it to Pinwheel Vista at some point in my life.